Aric Attas, Quantum Fluctuation No 1, Unique Photogram, Gelatin Silver Print, 14 x 11″, 1997. Quantum fluctuation refers to the constant flickering of matter and antimatter that fills the quantum vacuum. According to quantum cosmology these fluctuations, or “noise”, provided the seeds in the primordial plasm from which the universe(s) evolved. In other words, everything we can observe and imagine, from quarks, galaxies, and perhaps even parallel universes is the result of quantum flux; out of “nothingness” came everything. I approach the darkroom as a place for creative play. Disappearing through the blackened revolving door, I leave behind the traditional tools of photography; camera, lens, and shutter. As my eyes adjust to the darkened room, I become light-sensitized like my photographic materials. Under the ambient glow of an amber safelight, I mediate a convergence between art and science. 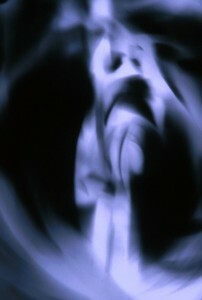 My work uses the photogram, or cameraless photograph, as a mode of exploration. This allows a direct approach to image making which enables me to respond to the materials and encourages experimentation. As I work I allow the process and materials to suggest new directions to follow. The event of watching the image emerge from emptiness in the developer is perhaps the most crucial and most exciting step. I rarely know exactly what will appear before me as each object responds to light in a unique way. The material that records this transmission also provides a characteristic rendering. Reading the images as they appear opens the paths that I follow as my exploration continues. To introduce the elements of chaos, surprise and ambiguity into the work, I often use nontraditional light sources which include flashlights, fluorescent tubes and fiber optics. Frequently, I use the techniques of multiple exposure and solarization (a partial reversal of tones) to produce mysterious images. I particularly favor moving my light source during exposure to create a strange and beautiful space within the picture. I have chosen to work with specific materials based on their associative potentials. The metallic silver paper, with its sleek surface suggests the space-age or the futuristic. In contrast, the metal etching plates, reminiscent of daguerreotypes or tintypes, call to mind the alchemical beginnings shared by photography and modern science. The sound pieces suggest what we might hear if we could listen to the noise of the Big Bang, the void of intergalactic space, or the whirring of subatomic particles. Visually the images speak of the cosmos which, like the darkroom, is a place of wonder. Journeys into the world of the micro- and macro-cosmic reveal clues which help us unravel the deep mysteries of the universe and ourselves. The interior of the atom and the depths of outer space provide evidence that the diversity of all things began from an ultimate simplicity at the beginning of time.